Startups often operate on a shoestring budget and can’t afford to pay many employees. 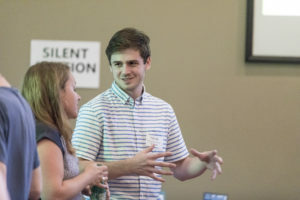 Mac students have skills they need—and they’re often intrigued by startups but need to earn tuition money over the summer. Macalester has developed a way to bridge that gap with the help of a grant from the Richard M. Schulze Family Foundation: MacNest. New in summer 2017, MacNest is a program that provides students with $4,500 grants allowing them to work full-time, unpaid, one-credit, summer internships with Twin Cities startups. It’s a great opportunity to try on the startup environment and consider if it might fit into their future plans. For 10 weeks, students lived together in a college-owned house, compared experiences, and took part in career-focused work led by the Career Development Center, including the opportunity to reflect on incorporating their values in their work, networking events, and mock interviews. When psychology and international studies major Elizabete Romanovska ’19 (Riga, Latvia) heard about MacNest, she immediately thought of ASIYA, an organization she learned about in her social entrepreneurship course. Muslim women and girls have often been inhibited from full participation in sports by the lack of activewear that respects their religious and cultural beliefs. ASIYA addresses that need by designing and selling sports hijabs. Interning with ASIYA was the perfect opportunity for Romanovska to explore entrepreneurship with a company that empowers Muslim females. Her interest in Muslim culture had been piqued by a course on Muslim Women Writers taught by Professor Jenna Rice. People who work in startups quickly learn to take on whatever needs to be done, and that was certainly true for Kaleb Mazurek ’18 (Chicago), who is majoring in international studies and Arabic. He interned at Cultivate International, a nonprofit that works with people who have ideas for their communities but need help with resources and expertise to bring them to fruition. An example of the kind of projects Cultivate works with is a job training center in India, where women take a nine-month textile class, then receive a loan to start their own businesses. Political science major Anna Rynearson ’19 (Rochester, Minn.) was already familiar with Cow Tipping Press from volunteering there as a teacher, but the internship afforded her a much broader perspective. Cow Tipping Press teaches creative writing classes for adults with developmental disabilities, and uses Lean Startup principles in their work. “As an intern for Cow Tipping Press, I focused on expanding the number of people that engage with Cow Tipping Press content in order to widen the scope of our social impact,” she says. “This entailed many cold calls to, and meetings with, professors, bookstores’ staff, and directors of nonprofits. I needed to find out who would amplify the voices of our authors on their own platforms by buying our books or hosting a workshop.” Rynearson also worked on internal evaluation and funding research. We are pleased to announce that thanks to the generosity of the Richard M. Schulze Family Foundation, the program has been funded for the summer of 2018 as well. The MacNest program is overseen by Kate Ryan Reiling ’00, Entrepreneur in Residence; Michael Porter, Director of the Internship Program; and John Mountain, Director of the Career Development Center.